June 1st marked the beginning of our birthday month. Yes, we celebrate the entire month. In fact, June is the busiest month of our lives. We have so much going on, there really is nothing else we can do but buckle up and enjoy the parties. There is the hubs birthday, my adorable fantastically amazing niece‘s bday, my late grandfather’s birthday, our proposal anniversary, my birthday, my brother & sister-in law‘s wedding anniversary, two cousin’s b-days, another cousin’s wedding anniversary, and a never ending plethora of plantation and/or beachside nuptials, cook-outs, celebrations, and shindigs. You ain’t gots to lie. If your June calendar looked like ours you’d party all month long too! Happy birthday to the most loving, caring, understanding, patient, humble, and sexiest man I have ever met. 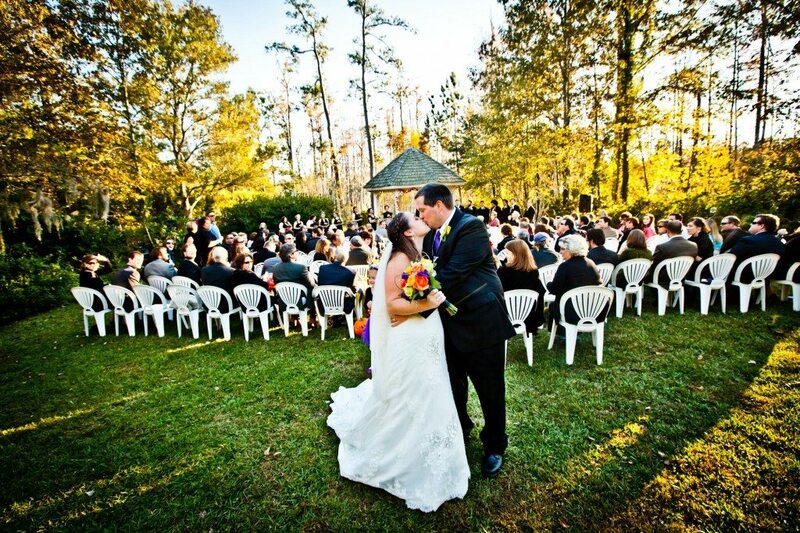 I love you more than you could ever know, and I feel honored to be your wife. I mean, what other foodie, food blogging wife would give you free reign for the week’s menu?!? Ok, I didn’t really give him free reign. Today’s recipe was inspired by one of our favorite things off of the menu at the Mellow Mushroom at Avondale. The only true differences between my version and their version are the crust, the fruit, the cheese, and the way the prosciutto is served. My version consists of a whole wheat pizza crust, fresh sliced peaches, crispy proscuitto bits, and asiago cheese curls. This flatbread is festooned with flavor, is super light and refreshing, and is puuuuuuurfect for a summertime supper. 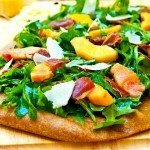 Note: If you can’t find a whole wheat pizza dough, follow this amazing recipe from How Sweet It Is and use whole wheat flour instead of regular white. Also, peach nectar can usually be found on the authentic Mexican foods aisle in any grocery store. I found the pizza dough and a bottle of peach juice at Trader Joes. Place dough on a floured cutting board and, using a rolling pin, roll dough into an oblong shape until it is about ¼ inch thick. You may have to use your hands a bit to stretch it out. Transfer to a cookie sheet lined with parchment paper and prick several times with a fork. If your cookie sheet is large enough, add the 3 slices of prosciutto as well. If not, place the prosciutto slices on a separate cookie sheet (I didn’t line this one, but I used a non-stick pan). Add olive oil to a small saucepan and place over medium heat. Crack open the garlic clove by placing it on a cutting board and smashing it with the heel of a large knife (it’s fine if it breaks into pieces), discard skin, and add clove to the oil. Let clove steep in the oil for 2-4 minutes, or until the clove starts to brown slightly. Lightly brush dough with the garlic infused oil. Bake the dough for 10-12 minutes. Remove prosciutto as soon as it is crispy about 8-10 mins. While dough is baking, peel and slice peaches. Set aside. For the dressing, whisk together peach nectar, dijon mustard, 1.5 tbsp garlic infused oil, and salt and pepper in a large mixing bowl. Place the arugula on top of the dressing, but DO NOT TOSS YET. Remove dough from oven and let cool slightly. 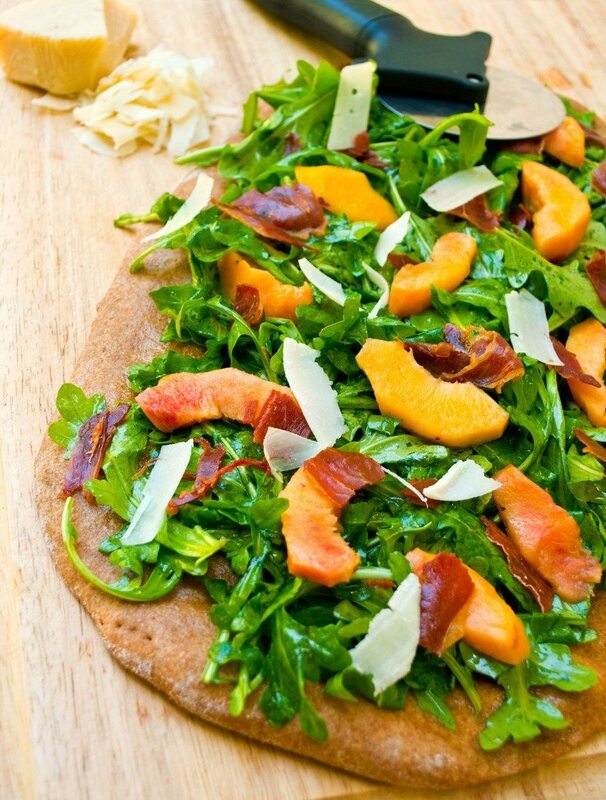 To assemble, toss the arugula with the dressing (adding more salt and pepper if needed) and place on top of the dough. 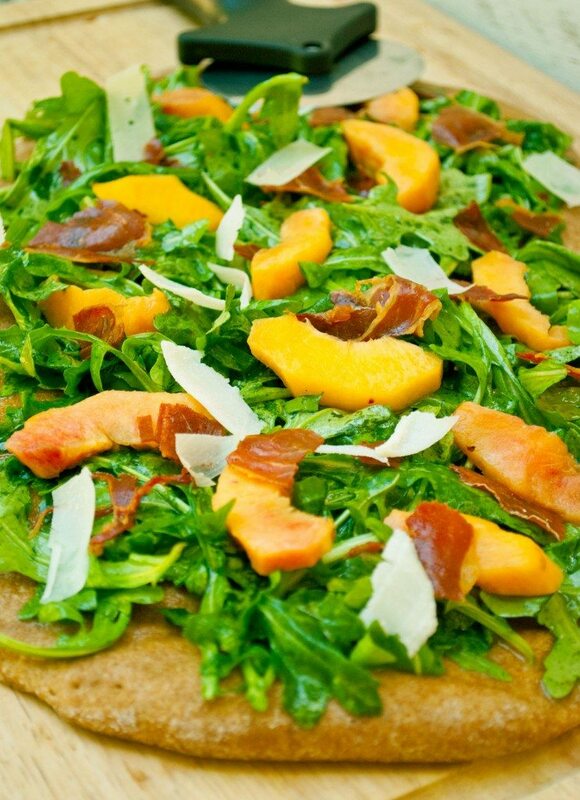 Crumble the prosciutto over the greens, add sliced peaches, and sprinkle with the shaved asiago cheese. Free rein over the menu? That IS generous! Haha. That’s quite a month – June 1st is my sister’s birthday and July 1st is mine, and July 31st was my dad’s and August 1st my parents’ wedding anniversary so the summer as a whole traditionally got busier. 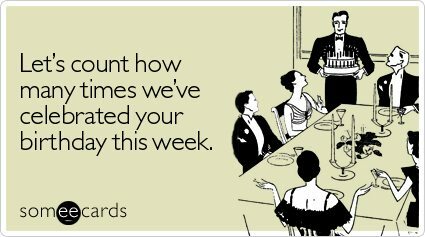 One of my cousin’s has a birthday in the middle of June, the other two days after mine, and my brother-in-law two days after that and on it goes! I guess summers were popular times to pop out the kids! 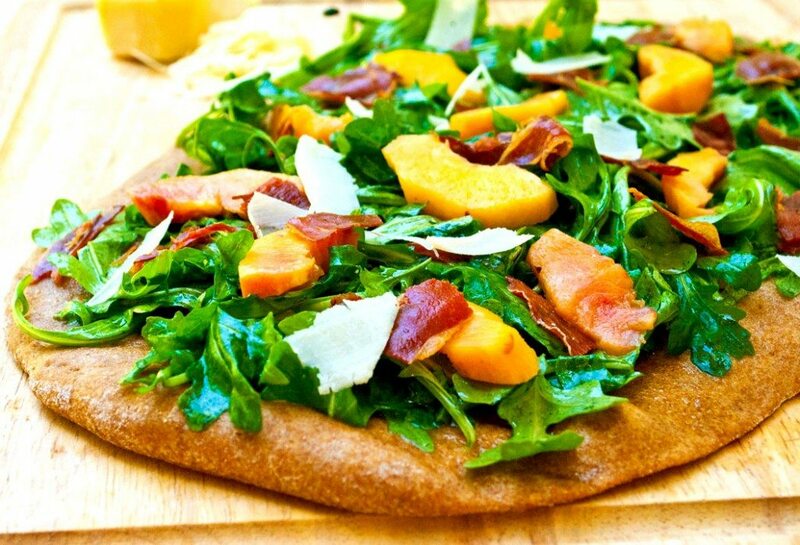 Love the idea of peaches on flatbread. Heavenly! Happy birthday month! This looks awesome. Thanks!!! Let me know how it turns out if you make it! This is the most beautiful thing I have ever seen! I have to try it thank you so much for sharing! Yay! Thank you! Let me know if you try it!